Background: Twenty one amide compounds possessing phenoxy/benzyloxy/pyridinyl groups have been synthesized by benzoylation of respective amines in presence of base with moderate to encouraging yields. Upon confirmation of structure, compounds were subjected for p38 kinase inhibitory, anti-inflammatory, antimicrobial and antitubercular activities. Method: Anti-inflammatory activity was determined using carrageenan induced rat paw edema model while p38 kinase inhibitory activity was studied using ELISA method and serial dilution method was employed to determine MICs. 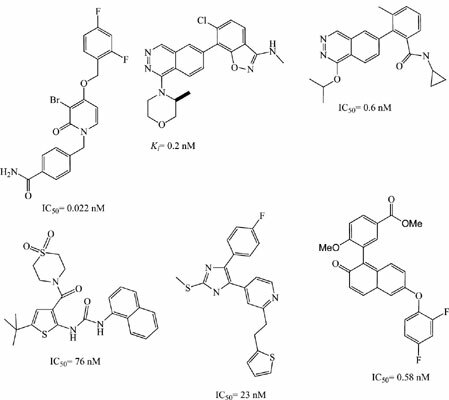 Two compounds 4g and 4n showed over 30% p38 kinase inhibitory activity at 10 µM and best anti-inflammatory activity was found for compounds 4g, 4i, 4n and 4o which exhibited to reduce paw edema over 70%. Compound 4b was observed to be the most potent against gram +ve organisms with MIC value of 1.6 µG/mL and compound 4u displayed potent antibacterial activity against gram negative organisms. Conclusion: Most encouraging antitubercular activity was noticed for compounds 4u, 4r and 4k with 6.25, 12.5 and 12.5 µG/mL Further, in order to know the binding site interactions, a docking simulations of compounds was performed. These preliminary results will certainly show fruitful directions to improve the activities of compounds. Keywords: Anti-inflammatory, antimicrobial, antitubercular, benzamide, p38 kinase, edema. Keywords:Anti-inflammatory, antimicrobial, antitubercular, benzamide, p38 kinase, edema. Abstract:Background: Twenty one amide compounds possessing phenoxy/benzyloxy/pyridinyl groups have been synthesized by benzoylation of respective amines in presence of base with moderate to encouraging yields. Upon confirmation of structure, compounds were subjected for p38 kinase inhibitory, anti-inflammatory, antimicrobial and antitubercular activities.